The Lagoon. How Aristotle Invented Science now in Paperback 3 for 2 in store 30% off online! In the Eastern Aegean lies an island of forested hills and olive groves, with streams, marshes and a lagoon that nearly cuts the land in two. It was here, over two thousand years ago, that Aristotle came to work. Aristotle was the greatest philosopher of all time. Author of the Poetics, Politics and Metaphysics, his work looms over the history of Western thought. But he was also a biologist – the first. Aristotle explored the mysteries of the natural world. With the help of fishermen, hunters and farmers, he catalogued the animals in his world, dissected them, observed their behaviours and recorded how they lived, fed, and bred. In his great zoological treatise, Historia animalium, he described the mating habits of herons, the sexual incontinence of girls, the stomachs of snails, the sensitivity of sponges, the flippers of seals, the sounds of cicadas, the destructiveness of starfish, the dumbness of the deaf, the flatulence of elephants and the structure of the human heart. And then, in another dozen books, he explained it all. 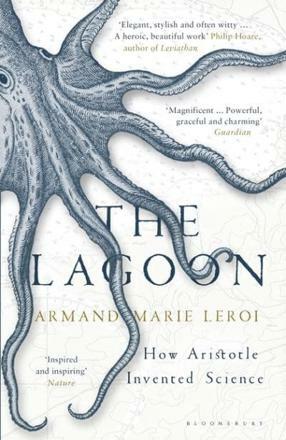 In The Lagoon, acclaimed biologist Armand Marie Leroi recovers Aristotle’s science. He goes to Lesbos to see the creatures that Aristotle saw, where he saw them, and explores the Philosopher’s deep ideas and inspired guesses – as well as the things that he got wildly wrong. Leroi shows how Aristotle’s science is deeply intertwined with his philosophical system and how modern science even now bears the imprint of its inventor.